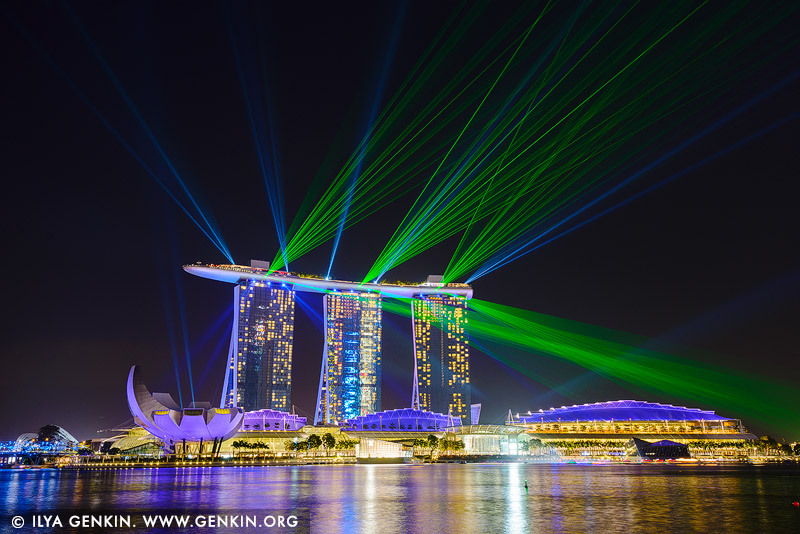 Light, laser and Water fountain Show at Marina Bay Sands is a must see event overlooking the beautiful Marina Skyline. Marina Bay Sands' Light and Water show combines five key elements: light, video, audio, water, and fire. For approximately fifteen minutes, you will be immersed into a laser light and water fountain show with projected images and videos telling about man's journey to life, with orchestral music (and Louis Armstrong's 'What a Wonderful World') at the background. Converging all the other elements like the dazzling pyrotechnics display and the bubbles floating up above (kids will surely enjoy it), it definitely sums up to one breathtaking and visually-appealing show like no other. There are also other places/tourist spots in the vicinity like the Merlion Park, Helix bridge, The Shoppes, Singapore Flyer, and the iconic Marina Bay Sands Hotel's Skypark where you can visit right after watching the show. Or if you're already tired, you can just eat at nearby restaurants and watch the scenic view of the buildings at the bay area. This image belongs to the travel and nature stock photo library. This stock photo of Marina Bay Sands Light and Water Show is available for licensing for commercial and editorial uses including websites, blogs, books, magazines, brochures and advertising. Restrictions may apply for images which contain third party copyrighted material or sensitive subjects. Photos of artwork are for editorial use only. This image id SINGAPORE-0011 of Marina Bay Sands Light and Water Show, is copyrighted © by Ilya Genkin. This is not a public domain image.